Our fleet Special Operations Omega Div. is looking for an active and engaging armada, position and armada discounts do not matter. We have fully completed all holdings with the exception of the Colony which we are upgrading to Tier 5 right now. We've had a couple armadas so far and all seem to be pretty dead overall and would love to find an active one so we can be part of that community. We have a range of players who enjoy doing everything this game has to offer such as accolade grinding, PvE, PvP, fun & games, you name it. We're pretty drama free and go with whatever the game throws at us. We also use both Discord and TeamSpeak and would love other fleets/armada to have that too. Our goal isn't to be on top of the leaderboard or focus on working everyone in the colony mines, we're all just trying to have fun and enjoy the game. We have a last gamma spot available in our Fed armada. We have both a Fed and KDF armada and a very active community, supported by our own website and discord. 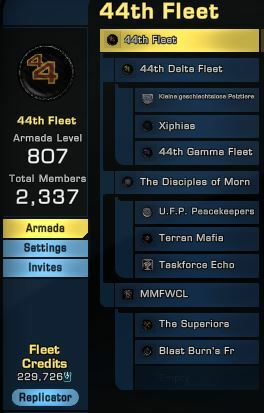 Check us out at startrek.44thfleet.com and feel free to contact me here or in-game (@marcase) for any questions. Our Armada postitions have been filled again. If you guys are still in STO, I'm still interested in doing some RP projects together. Hi Locutus, if you still looking for a new home for your fleet we have slot open. Feel free to take a look at our link and contact me if interested.